For other uses, see Weight loss (disambiguation). Weight loss is achieved by adopting a lifestyle in which fewer calories are consumed than are expended. According to the UK National Health Service this is best achieved by monitoring calories eaten and supplementing this with physical exercise. Depression, stress or boredom may also contribute to weight increase, and in these cases, individuals are advised to seek medical help. A 2010 study found that dieters who got a full night's sleep lost more than twice as much fat as sleep-deprived dieters. Though hypothesized that supplementation of vitamin D may help, studies do not support this. The majority of dieters regain weight over the long term. According to the Dietary Guidelines for Americans those who achieve and manage a healthy weight do so most successfully by being careful to consume just enough calories to meet their needs, and being physically active. In Western Europe, sales of weight-loss products, excluding prescription medications, topped €1,25 billion (£900 million/$1.4 billion) in 2009. In addition, malnutrition can lead to vitamin and other deficiencies and to inactivity, which in turn may pre-dispose to other problems, such as pressure sores. Unintentional weight loss can be the characteristic leading to diagnosis of diseases such as cancer and type 1 diabetes. In the UK, up to 5% of the general population is underweight, but more than 10% of those with lung or gastrointestinal diseases and who have recently had surgery. According to data in the UK using the Malnutrition Universal Screening Tool ('MUST'), which incorporates unintentional weight loss, more than 10% of the population over the age of 65 is at risk of malnutrition. A high proportion (10–60%) of hospital patients are also at risk, along with a similar proportion in care homes. Impaired intake Poor appetite can be a direct symptom of an illness, or an illness could make eating painful or induce nausea. Illness can also cause food aversion. Inability to eat can result from: diminished consciousness or confusion, or physical problems affecting the arm or hands, swallowing or chewing. Eating restrictions may also be imposed as part of treatment or investigations. Lack of food can result from: poverty, difficulty in shopping or cooking, and poor quality meals. Impaired digestion &/or absorption This can result from conditions that affect the digestive system. Altered requirements Changes to metabolic demands can be caused by illness, surgery and organ dysfunction. Excess nutrient losses Losses from the gastrointestinal can occur because of symptoms such as vomiting or diarrhea, as well as fistulae and stomas. There can also be losses from drains, including nasogastric tubes. Other losses: Conditions such as burns can be associated with losses such as skin exudates. People with HIV often experience weight loss, and it is associated with poorer outcomes. Wasting syndrome is an AIDS-defining condition. Infection. Some infectious diseases can cause weight loss. Fungal illnesses, endocarditis, many parasitic diseases, AIDS, and some other subacute or occult infections may cause weight loss. Renal disease. Patients who have uremia often have poor or absent appetite, vomiting and nausea. This can cause weight loss. Cardiac disease. 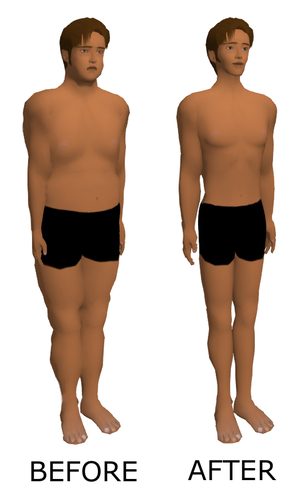 Cardiovascular disease, especially congestive heart failure, may cause unexplained weight loss. Oral, taste or dental problems (including infections) can reduce nutrient intake leading to weight loss. Early post-operative nutrition is a part of Enhanced Recovery After Surgery protocols. These protocols also include carbohydrate loading in the 24 hours before surgery, but earlier nutritional interventions have not been shown to have a significant impact. Some medications can cause weight loss, while others can cause weight gain. Some popular beliefs attached to weight loss have been shown to either have less effect on weight loss than commonly believed or are actively unhealthy. According to Harvard Health, the idea of metabolism being the "key to weight" is "part truth and part myth" as while metabolism does affect weight loss, external forces such as diet and exercise have an equal effect. They also commented that the idea of changing one's rate of metabolism is under debate. Diet plans in fitness magazines are also often believed to be effective, but may actually be harmful by limiting the daily intake of important calories and nutrients which can be detrimental depending on the person and are even capable of driving individuals away from weight loss. Obesity increases health risks, including diabetes, cancer, cardiovascular disease, high blood pressure, and non-alcoholic fatty liver disease, to name a few. Reduction of obesity lowers those risks. A 1-kg loss of body weight has been associated with an approximate 1-mm Hg drop in blood pressure. ^ a b c LeBlanc, E; O'Connor, E; Whitlock, EP (October 2011). "Screening for and management of obesity and overweight in adults". Evidence Syntheses, No. 89. U.S. Agency for Healthcare Research and Quality (AHRQ). Retrieved 27 June 2013. ^ a b Institute for Quality and Efficiency in Health Care. "Health benefits of losing weight". Fact sheet, Informed Health Online. Institute for Quality and Efficiency in Health Care. Retrieved 27 June 2013. ^ a b "Health Weight – Understanding Calories". National Health Service. 19 August 2016. ^ "Moods for Overeating: Good, Bad, and Bored". Psychology Today. Retrieved 17 October 2018. ^ Nedeltcheva, AV; Kilkus, JM; Imperial, J; Schoeller, DA; Penev, PD (2010). "Insufficient sleep undermines dietary efforts to reduce adiposity". Annals of Internal Medicine. 153 (7): 435–41. doi:10.7326/0003-4819-153-7-201010050-00006. PMC 2951287. PMID 20921542. ^ Harmon, Katherine (4 October 2010). "Sleep might help dieters shed more fat". Scientific American. Retrieved 20 October 2010. ^ Pathak, K.; Soares, M. J.; Calton, E. K.; Zhao, Y.; Hallett, J. (1 June 2014). "Vitamin D supplementation and body weight status: a systematic review and meta-analysis of randomized controlled trials". Obesity Reviews. 15 (6): 528–37. doi:10.1111/obr.12162. ISSN 1467-789X. PMID 24528624. ^ Sumithran, Priya; Proietto, Joseph (2013). "The defence of body weight: A physiological basis for weight regain after weight loss". Clinical Science. 124 (4): 231–41. doi:10.1042/CS20120223. PMID 23126426. ^ "Executive Summary". Dietary Guidelines 2015–2020. Retrieved 2 May 2016. ^ "World Health Organization recommends eating less processed food". BBC News. 3 March 2003. ^ "Choosing a safe and successful weight loss program". Weight-control Information Network. National Institute of Diabetes and Digestive and Kidney Diseases. April 2008. Retrieved 26 January 2011. ^ Albgomi. "Bariatric Surgery Highlights and Facts". Bariatric Surgery Information Guide. bariatricguide.org. Retrieved 13 June 2013. ^ "Gastric bypass risks". Mayo Clinic. 9 February 2009. ^ Neumark-Sztainer, Dianne; Sherwood, Nancy E.; French, Simone A.; Jeffery, Robert W. (March 1999). "Weight control behaviors among adult men and women: Cause for concern?". Obesity Research. 7 (2): 179–88. doi:10.1002/j.1550-8528.1999.tb00700.x. PMID 10102255. ^ Thomas, Paul R. (January – February 2005). "Dietary Supplements For Weight Loss?". Nutrition Today. 40 (1): 6–12. ^ Barabasz, Marianne; Spiegel, David (1989). "Hypnotizability and weight loss in obese subjects". International Journal of Eating Disorders. 8 (3): 335–41. doi:10.1002/1098-108X(198905)8:3<335::AID-EAT2260080309>3.0.CO;2-O. ^ a b Kirsch, I. (June 1996). "Hypnotic enhancement of cognitive-behavioral weight loss treatments–another meta-reanalysis". Journal of Consulting and Clinical Psychology. 64 (3): 517–19. doi:10.1037/0022-006X.64.3.517. PMID 8698945. INIST:3143031. ^ Andersen, M. S. (1985). "Hypnotizability as a factor in the hypnotic treatment of obesity". International Journal of Clinical and Experimental Hypnosis. 33 (2): 150–59. doi:10.1080/00207148508406645. PMID 4018924. ^ Allison, David B.; Faith, Myles S. (June 1996). "Hypnosis as an adjunct to cognitive-behavioral psychotherapy for obesity: A meta-analytic reappraisal". Journal of Consulting and Clinical Psychology. 64 (3): 513–16. doi:10.1037/0022-006X.64.3.513. PMID 8698944. ^ Ruiz, F. J. (2010). "A review of Acceptance and Commitment Therapy (ACT) empirical evidence: Correlational, experimental psychopathology, component and outcome studies". International Journal of Psychology and Psychological Therapy. 10 (1): 125–62. ^ "The facts about weight loss products and programs". DHHS Publication No (FDA) 92-1189. US Food and Drug Administration. 1992. Archived from the original on 26 September 2006. Retrieved 14 May 2013. ^ "Profiting From America's Portly Population". PRNewswire (Press release). Reuters. 21 April 2008. Retrieved 17 January 2009. ^ a b "No evidence that popular slimming supplements facilitate weight loss, new research finds". 14 July 2010. Retrieved 19 July 2010. ^ a b c d e f g h i j k l National Cancer Institute (November 2011). "Nutrition in cancer care (PDQ)". Physician Data Query. National Cancer Institute. Retrieved 3 July 2013. ^ a b Huffman, GB (15 February 2002). "Evaluating and treating unintentional weight loss in the elderly". American Family Physician. 65 (4): 640–50. PMID 11871682. ^ a b c d e f g h i Payne, C; Wiffen, PJ; Martin, S (18 January 2012). Payne, Cathy (ed.). "Interventions for fatigue and weight loss in adults with advanced progressive illness". The Cochrane Database of Systematic Reviews. 1: CD008427. doi:10.1002/14651858.CD008427.pub2. PMID 22258985. ^ Institute of Medicine (U.S.). Committee on Nutrition Services for Medicare Beneficiaries (9 June 2000). The role of nutrition in maintaining health in the nation's elderly: evaluating coverage of nutrition services for the Medicare population. p. 67. ISBN 978-0-309-06846-8. ^ a b c d e f g h National Collaborating Centre for Acute Care (UK) (February 2006). "Nutrition Support for Adults: Oral Nutrition Support, Enteral Tube Feeding and Parenteral Nutrition". NICE Clinical Guidelines, No. 32. National Collaborating Centre for Acute Care (UK). ^ a b c d e Yaxley, A; Miller, MD; Fraser, RJ; Cobiac, L (February 2012). "Pharmacological interventions for geriatric cachexia: a narrative review of the literature". The Journal of Nutrition, Health & Aging. 16 (2): 148–54. doi:10.1007/s12603-011-0083-8. PMID 22323350. ^ a b c d e f Itoh, M; Tsuji, T; Nemoto, K; Nakamura, H; Aoshiba, K (18 April 2013). "Undernutrition in patients with COPD and its treatment". Nutrients. 5 (4): 1316–35. doi:10.3390/nu5041316. PMC 3705350. PMID 23598440. ^ Nygaard, B (19 July 2010). "Hyperthyroidism (primary)". Clinical Evidence. 2010: 0611. PMC 3275323. PMID 21418670. ^ National Collaborating Centre for Chronic Conditions (UK) (2004). Type 1 diabetes in adults: National clinical guideline for diagnosis and management in primary and secondary care. NICE Clinical Guidelines, No. 15.1. Royal College of Physicians UK. ISBN 978-1860162282. Retrieved 3 July 2013. ^ a b Mangili, A; Murman, DH; Zampini, AM; Wanke, CA (15 March 2006). "Nutrition and HIV infection: review of weight loss and wasting in the era of highly active antiretroviral therapy from the nutrition for healthy living cohort". Clinical Infectious Diseases. 42 (6): 836–42. doi:10.1086/500398. PMID 16477562. ^ Massompoor SM (April 2004). "Unintentional weight loss". Shiraz E-Medical Journal. 5 (2). ^ Andersen, HK; Lewis, SJ; Thomas, S (18 October 2006). Andersen, Henning Keinke (ed.). "Early enteral nutrition within 24h of colorectal surgery versus later commencement of feeding for postoperative complications". The Cochrane Database of Systematic Reviews (4): CD004080. doi:10.1002/14651858.CD004080.pub2. PMID 17054196. Lay summary. ^ a b Burden, S; Todd, C; Hill, J; Lal, S (2012). Burden, Sorrel (ed.). "Pre‐operative Nutrition Support in Patients Undergoing Gastrointestinal Surgery" (PDF). The Cochrane Database of Systematic Reviews. 11 (11): CD008879. doi:10.1002/14651858.CD008879.pub2. PMID 23152265. Lay summary. ^ Mariotti, KC; Rossato, LG; Fröehlich, PE; Limberger, RP (November 2013). "Amphetamine-type medicines: a review of pharmacokinetics, pharmacodynamics, and toxicological aspects". Current Clinical Pharmacology. 8 (4): 350–57. doi:10.2174/15748847113089990052. PMID 23342978. ^ Sarnes, E; Crofford, L; Watson, M; Dennis, G; Kan, H; Bass, D (October 2011). "Incidence and US costs of corticosteroid-associated adverse events: a systematic literature review". Clinical Therapeutics. 33 (10): 1413–32. doi:10.1016/j.clinthera.2011.09.009. PMID 21999885. ^ Serretti, A; Mandelli, L (October 2010). "Antidepressants and body weight: a comprehensive review and meta-analysis". The Journal of Clinical Psychiatry. 71 (10): 1259–72. doi:10.4088/JCP.09r05346blu. PMID 21062615. ^ Alibhai, SM; Greenwood, C; Payette, H (15 March 2005). "An approach to the management of unintentional weight loss in elderly people". Canadian Medical Association Journal. 172 (6): 773–80. doi:10.1503/cmaj.1031527. PMC 552892. PMID 15767612. ^ a b "Does Metabolism Matter in Weight Loss?". Harvard Health. Retrieved 18 June 2018. ^ Long, Jacqueline (2015). The Gale Encyclopedia of Senior Health. Detroit, MI: Gale. ISBN 978-1573027526. ^ Harsha, D. W.; Bray, G. A. (2008). "Weight Loss and Blood Pressure Control (Pro)". Hypertension. 51 (6): 1420–25. doi:10.1161/HYPERTENSIONAHA.107.094011. ISSN 0194-911X. PMID 18474829. Wikimedia Commons has media related to Weight loss.